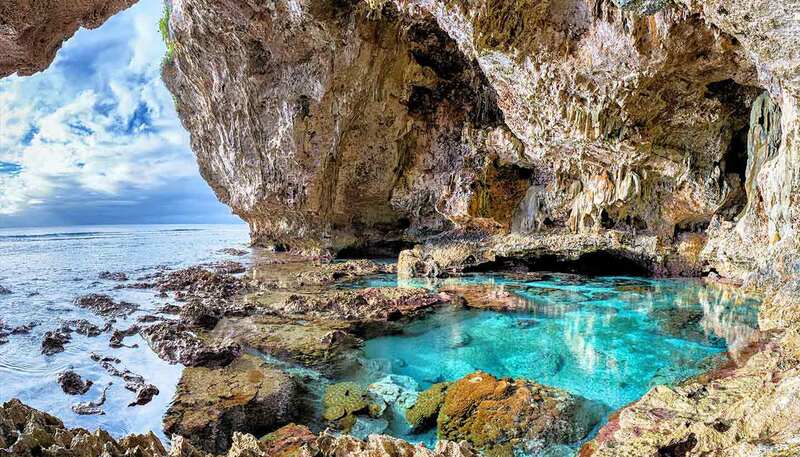 Most of the inhabitants of Niue descend from settlers from Tonga, Samoa and Fiji, who arrived between AD 600-1000, developing their own particular culture. The first Europeans reached Niue in the wake of Captain Cook's expedition to the region in 1774. Administered by the London Missionary Society from 1846, it became a British Protectorate in 1900. The island was then formally annexed to New Zealand in 1901, as part of the Cook Islands. In October 1974, Niue was granted 'self-government in free association with New Zealand', making it the smallest self-governing state with that status. This also allows Niueans to retain New Zealand citizenship while maintaining self-government in their own country. The only formal political party is the Niue People's Party (NPP), which has dominated politics on the island since its formation in 1987. Although it has not always enjoyed an absolute majority, it has been able to govern with the support of independents. The current premier is the veteran Mititaigimimene Young Vivian who took over following the most recent poll in April 2002. The major problems facing Niue are chronic population decline caused by emigration and the fragility of the island's status as an offshore tax haven (see Economy section), which is under threat from new measures designed to tackle international money laundering. Niue is also vulnerable to Pacific cyclones: in January 2004, the island suffered serious damage from Cyclone Heta. Most people belong to the Ekalesia Niue, a Protestant denomination; also Latter Day Saints (Mormon), Jehovah's Witness, Roman Catholic, Seventh Day Adventist and other Christian denominations. Niuean children are bestowed with gifts of money or handmade mats and cloths from their relatives upon coming of age, when girls have their ears pierced and boys receive their first haircut. It is polite to ask permission before entering private land. Niueans consider Sunday as a serious day of rest and most attend church both in the morning and afternoon. While many people play golf, go swimming or sightsee, certain activities, such as boating and fishing, are not allowed on Sunday. For further information on Sunday protocol, contact the Niue Tourism Office (see Contact Addresses). Clothing is usually casual, cool and comfortable but women often wear a hat and cover their shoulders for church and men wear long trousers. Swimming attire is not acceptable in towns or villages.